So much yarn, so little time. : GeoCaching...part 4! Yes I know, I'm sounding like a newly-quit exsmoker or a televangelist, aren't I? But it's SUCH FUN! Today we found a biggie - a travelbug. "What is a Groundspeak Travel Bug? Simply put, a Groundspeak Travel Bug is a trackable tag that you attach to an item. 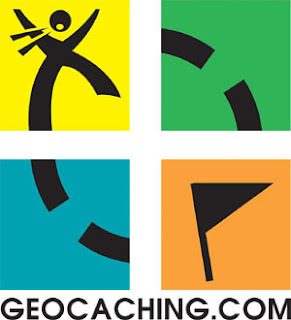 This allows you to track your item on Geocaching.com. The item becomes a hitchhiker that is carried from cache to cache (or person to person) in the real world and you can follow its progress online." The particular bug we found was in the form of a china goose with the tracking tag attached. When I looked up its "mission" online, apparently it wants to travel around Saudi Arabia. I'm not entirely sure how I'm supposed to help it with its mission, as I'm in the UK and don't even have a passport, let alone plans of exotic travel! The item sitting next to the goose is a geocoin, another trackable item. We left that behind though, as there was a note in the log to say its owner wants to retrieve it. Quite restores your faith in human nature, doesn't it? 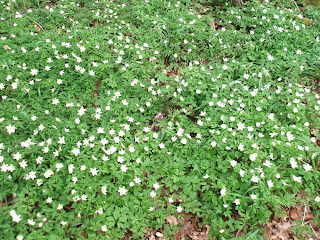 Here's your chance to play "spot the meerkat"...he's in the middle of a woodfull of wood anemones. We met a very friendly goat en route! This does look fun! I love the idea of all these little objects hidden around the country. I'll have to give it a go! It does look like great fun! It looks so much fun, I think we're going to have to give it a go, too! It's amazing because a few months ago I'd never even heard of it and now it's cropping up everywhere I look. It even got on "Countryfile" a few weeks ago! Looks like you have caught the geocaching bug. Seems like loads of fun. How interesting! Like a treasure hunt? I'll have to check it out. Thanks for visiting today and commenting on the birdhouses. Love the TB that you found. Good luck, and thank you for posting this, hopefully it will help draw more people to this great hobby!